As fifty new mission presidents begin service﻿—and five presidents already in the field transfer to new missions﻿—a picture of worldwide growth of the Church emerges. Of nine new missions created this summer, only three are in the United States. Four Spanish-speaking missions have been organized, matching four English-speaking missions. And the ninth new mission is Italian-speaking. The headquarters of the new Italy Catania Mission (Leopoldo Larcher, president, transferred from Italy Rome Mission) is located on the Mediterranean island of Sicily. Joseph Coletti now presides over the Italy Rome Mission. The new Spanish-speaking missions are the Bolivia Santa Cruz Mission (DeVere R. McAllister, president, transferred from Bolivia La Paz Mission); the Chile Osorno Mission (Lester D. Haymore, president, transferred from Chile Concepcion Mission); the Paraguay Asuncion Mission (Mearl K. Bair, president); and the Guatemala Quezaltenango Mission (John F. O’Donnal, president, transferred from Guatemala Guatemala City Mission), bringing the total number of Latin-American missions to thirty-one. The new English-speaking missions are the Philippines Davao Mission (Layton B. Jones, president), where many native dialects are also spoken; the Missouri St. Louis Mission (Norman W. Olsen, president); the Ohio Cleveland Mission (Donald S. Brewer, president, transferred from Ohio Columbus Mission); and the Pennsylvania Philadelphia Mission (Louis K. Payne, president). One of the new mission presidents this year is Elder Hartman Rector, Jr., of the First Quorum of the Seventy, who now presides over the California San Diego Mission. Other new presidents of U.S. missions are Lindsay R. Curtis, California Oakland Mission; Max C. Mortenson, Indiana Indianapolis; C. Jack Lemmon, Louisiana Baton Rouge; Jae R. Ballif, Massachusetts Boston; John R. Poulton, New Mexico Albuquerque; Roland R. Wright, New York New York; Frank D. Bailey, Ohio Columbus; Calvin G. Merkley, Oklahoma Tulsa; J. Garr Vincent, Oregon Portland; Frank A. Moscon, Virginia Roanoke; Lyle M. Ward, Washington D.C.; and Norwood C. McKoy, Washington Seattle. New presidents of English-speaking missions outside the U.S. are Marvin W. Wallin, Australia Adelaide Mission; Keith W. Hubbard, Australia Brisbane; Bruce Mitchell, Australia Melbourne; Ramond L. Russell, Canada Toronto; Steven J. Scott, Canada Vancouver; Marvin L. Pugh, Ireland Dublin; Philip T. Sonntag, New Zealand Christchurch; and Stephen K. Iba, Philippines Manila. Fourteen new presidents have been called to Spanish-speaking missions. Besides President Bair of the new Paraguay Asuncion Mission are Ireneo Frol, Argentina Buenos Aires South Mission; R. Chase Allred, Bolivia La Paz; Leon R. Walker, Chile Concepcion; Bruce M. Gibson, Chile Santiago South; Kirt M. Olson, Colombia Bogotá; Joseph C. Muren, Costa Rica San José; Richard L. Millett, Florida Ft. Lauderdale; Willard I. Skousen, Guatemala Guatemala City; Verle M. Allred, Mexico Hermosillo; Richard P. Gomez, Mexico Monterrey; Norval C. Jesperson, Peru Lima South; Marion C. Robinson, Uruguay Montevideo; and Alejandro Portal, Venezuela Caracas. Eleven other nations have new mission presidents. Besides Italy (mentioned above), new presidents serving in Europe are James S. Arrigona, Belgium Brussels Mission; John L. Flade, Germany Frankfurt; John M. Limburg, Netherlands Amsterdam; and Dean T. Worlton, Switzerland Zurich. In the South Pacific, Faasea Mailo now presides over the Samoa Apia Mission and Sione T. Latu presides over the Tonga Nuku’alofa Mission. And the five new presidents called to serve in Oriental missions are David H. H. Chen, Hong Kong Mission; Robert T. Stout, Japan Kobe; Richard D. S. Kwak, Japan Sendai; F. Ray Hawkins, Korea Seoul; and William F. Crook, Taiwan Taipei. Today the total number of missions in the world is 158. Of those, 51﻿—less than a third﻿—are in the United States. 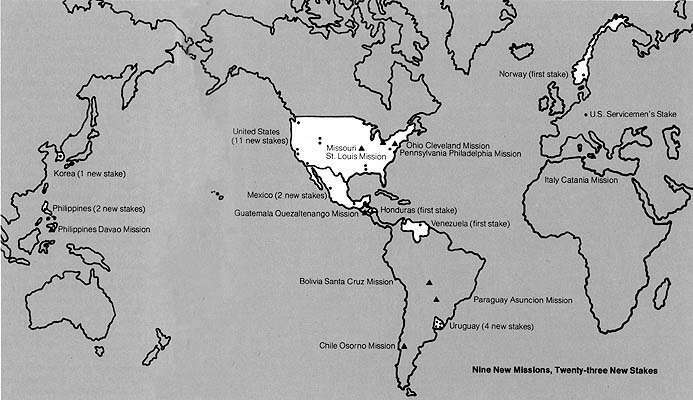 Japan and Mexico both contain seven missions of the Church; there are six missions each in Canada and England (making a total of eight in the United Kingdom﻿—the six in England and two in Scotland); and Australia contains five missions. There are four missions each in Argentina, Brazil, Chile, Germany, and Italy, and three missions each in New Zealand, the Philippines, and Spain. Many of these nations with multiple missions were opened to missionary work only within the last forty years﻿—and some of them have had missionaries for only a decade or less.